I have been watching your blog to see when those kids would come.Also thank-you for the blow by blow description of the whole process.Those little ones are pretty cute. The same thing happened to us with our Nigerian kidding on Tuesday. 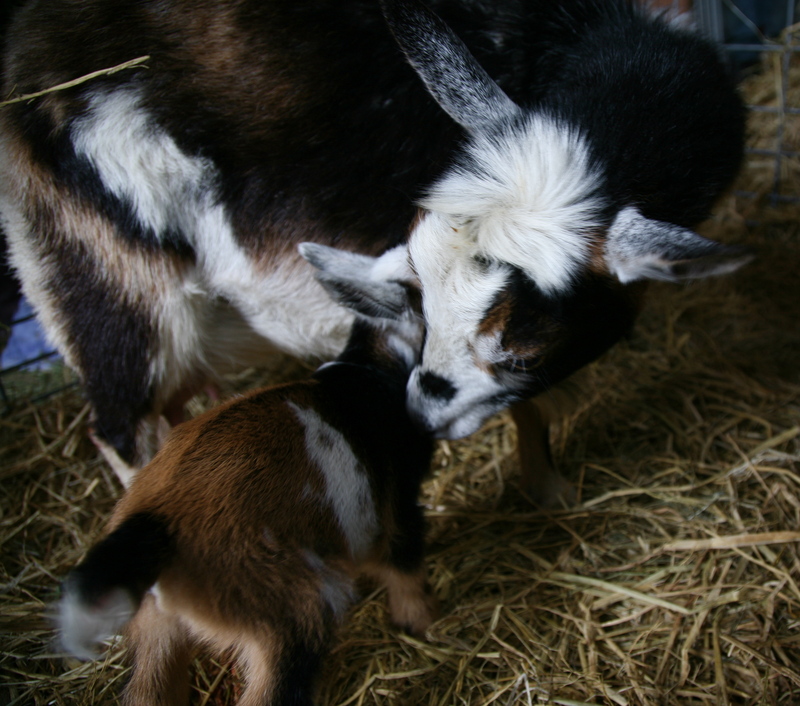 I have been feeling so guilty about losing the first doeling and wondering why she was SO large when the second one who followed her was SO small (but doing fine and absolutely gorgeous). What you said makes perfect sense, though. We bought our doe, already bred. The man from whom we bought her told us that he just left her in the kidding pen with the buck for three consecutive days while she was in heat. I think the two does were definitely from different matings over those three days. 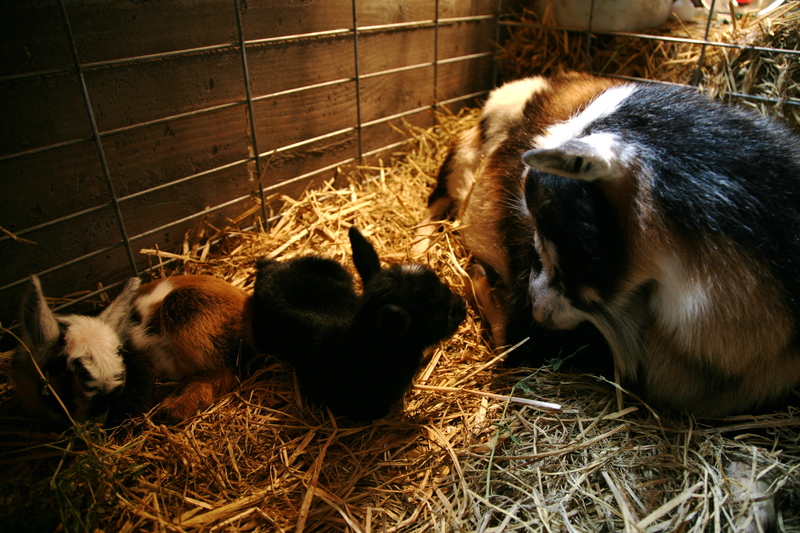 The vet was just here to check her over (she didn’t completely expel the placenta, so he had to remove it). He said that she’s acting as though she’s still in labor, though. He tried bouncing her, but she’s tight as a drum. I thought I still saw movement on her right side today. Have you ever heard, in a situation like this, of another kid being born a day or two later? We’re hopeful that there’s another healthy baby in there. Have you tried using a stethoscope to hear if there are any additional heartbeats in there? I was able to hear the kids’ heartbeats by putting the stethoscope just in front of the udder on the right-hand side. I had to move around a bit — it seemed like I had to be literally right above the baby to hear the heartbeat — but eventually I was able to hear them. 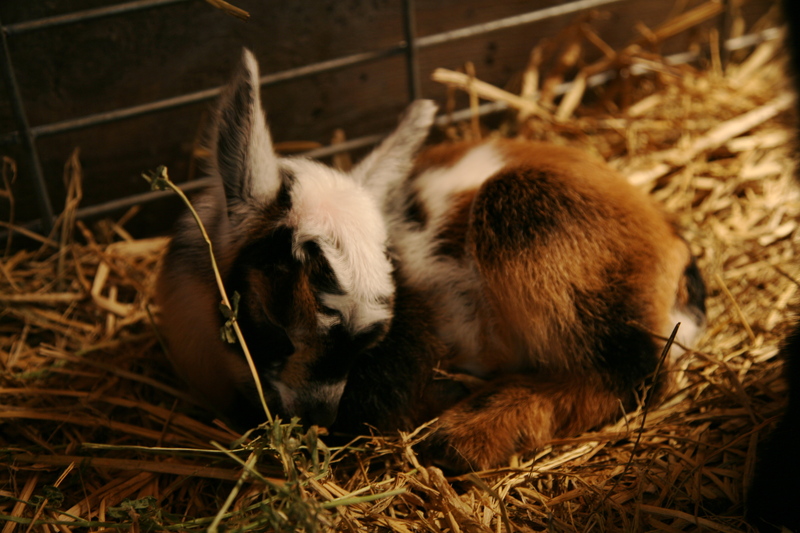 Did your vet go inside the doe to remove the placenta? 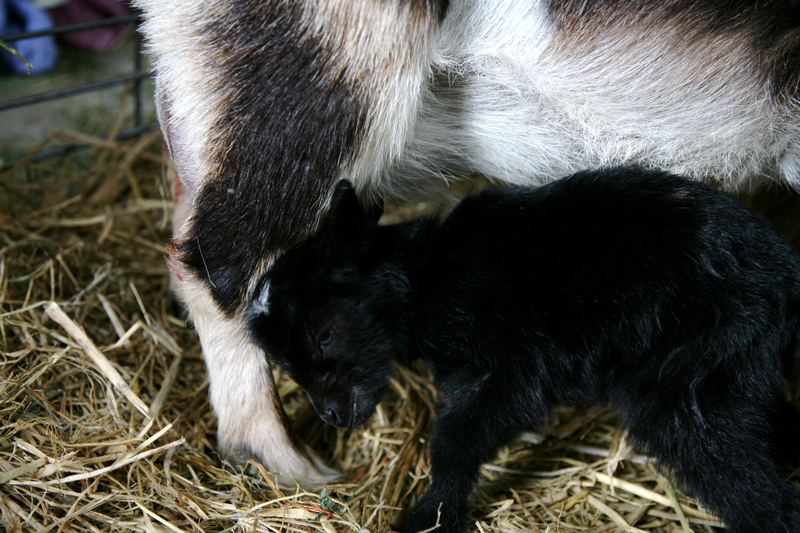 I am not a vet and by no means an expert, but from what I’ve been told by other “goat midwives” it seems like it would be a good idea to check the birth canal, see if the cervix is dilated, and if it is see if you can feel another kid in there. If she is really still in labor I’d think that the baby needs to come out soon. 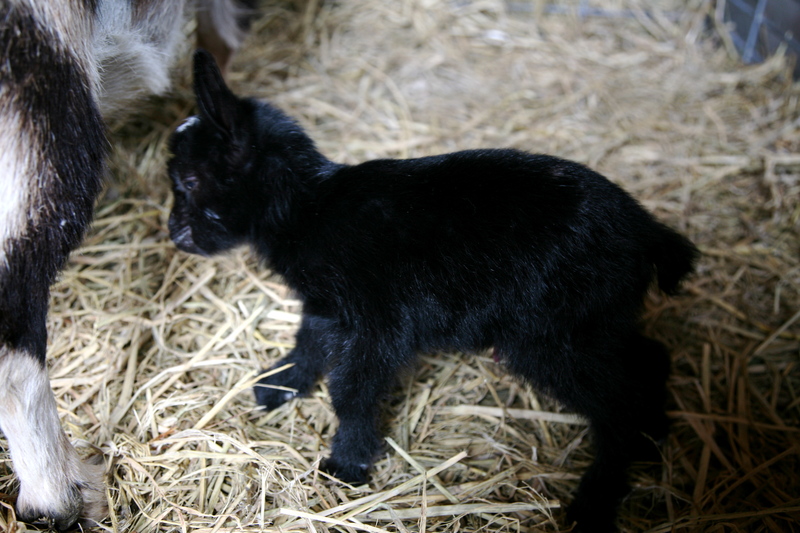 As for whether a kid could be born a couple of days after the other two, I’d recommend visiting thegoatspot.net. There was one story like that on the board if I remember right. Let me know what happens and best of luck! By the way, I’ve been told by other Nigerian breeders that it has been a weird year for kidding and that stories like yours and mine had been strangely common this year. Just wanted to drop you guys a line and let you know that I miss you! I always enjoy reading your blog, and I hope we’ll get to see some more farming posts again soon! I know you’ve got a lot going on, but I hope you are still getting your hands dirty. Take care!